This is from the University of Oregon Website with ticket prices and but the part of the article which states that "Under certain circumstances, it is possible that one or more of the advertised athletes will not be able to participate in the NIKE Clash of the Champions." So we will just have to see what happens. EUGENE, Ore. - Score another ace for Matthew Knight Arena. The University of Oregon's sparkling new facility will host four of the biggest stars from the professional tennis circuit, Roger Federer, Rafael Nadal, Maria Sharapova and Serena Williams, who are scheduled to perform March 8 in the "NIKE Clash of the Champions." A portion of the proceeds from the exhibition will benefit each of the four athletes' charitable foundations. "We are extremely excited to host some of the biggest names in professional tennis in Matthew Knight Arena," said Oregon Director of Athletics Rob Mullens. "Our unique partnership with NIKE has allowed us to attract this one-of-a-kind event to the University of Oregon and the Eugene-Springfield community. 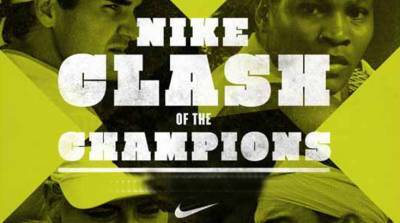 "The NIKE Clash of the Champions is going to create tremendous buzz up and down the Willamette Valley," said Mullens. "It is a great example of the variety of events we are able to feature at Matthew Knight Arena." The event, which will begin at 5:30 p.m., will feature Sharapova and Williams playing a singles set, followed by a mixed doubles set and concluding with a men's singles set between the top two players in the world, Federer and Nadal. Federer owns a men's record 16 Grand Slam singles titles, including the 2010 Australian Open, while Nadal counts the 2010 French Open, Wimbledon and U.S. Open among his nine career Slam titles. Sharapova brings the 2004 Wimbledon, 2006 U.S. Open and 2008 Australian Open to Eugene, while Williams has captured an amazing 27 career Grand Slam victories - 13 singles, 12 women's doubles and two mixed doubles - including singles titles in the 2010 Australian Open and Wimbledon.